For courses in public relations. Featuring an intensely practical approach that favors reasoning, justification, and applications that work, The Practice of Public Relations prepares students for contemporary public relations work in the changing landscape of the 21st century. Fraser Seitel’s writing combines a contemporary, real-life approach that marries his experience in the field with a light-hearted, energetic prose style. This Thirteenth Edition has been thoroughly updated to include recent public relations cases with a continued emphasis on ethics, using examples that span several fields and countries. 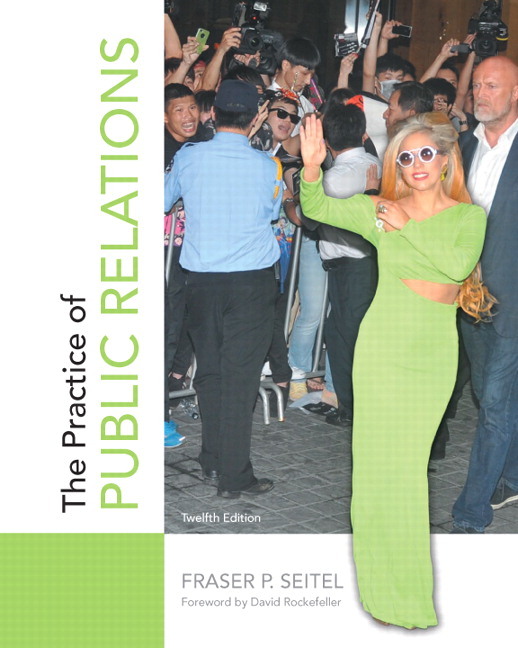 Building on the successes of the previous edition, this text remains the most visual text on the market, as well as the most comprehensive in its discussion of social media as it relates to public relations. Contemporary, Real-­Life Approach. This straightforward text places emphasis on the principles, processes, and practices that lead to building positive relationships in a 24/7 communications environment. Seitel’s contemporary, real-­life approach is designed to increase student enthusiasm for public relations study and practice. Unique Perspective. The extensive explanation of Social Media and its application to public relations practice is unique in public relations textbooks. Talking Points features expose off­line curiosities that make the practice of public relations such a fascinating art form. Suggested Readings helpmake this text themost comprehensive, post­-2000 bibliography in public relations literature. Author’s Writing Style. Seitel balances appropriate theoretical coverage with light-hearted and opinionated prose that infuses the subject with the energy that defines the industry. Visual Format. With over 75 photographs and in full color, this is the most visual text on the market, emphasizing the liveliness, vitality, and relevance of the field. Taken straight from the newswire, Newscom photos add a real­-life feel that isn’t found in any other textbook. NEW! Expanded social media content in Chapter 10 encompasses the most up-to-date analysis of social media applications to public relations practice. In addition, comprehensive coverage of the role of social media in public relations is discussed throughout the text. As in so many other lines of work, mastering social media has become a key tool for public relations practitioners to engage in “direct conversations” with the public. No public relations textbook offers a more comprehensive discussion of social media. UPDATED! “Public Relations Bookshelf” features the most current public relations literature—primarily post-2004—as well as one new contemporary “Pick of the Literature” per chapter. NEW! Every chapter begins with a contemporary issue relating to the chapter content – from ISIS terrorists’ use of public relations for diabolical ends, to Kim Kardashian’s tweeting controversy, to her step-father Caitlyn Jenner’s coming-out communications. Edward Snowden: Criminal or hero? Expanded social media content in Chapter 10 encompasses the most up-to-date analysis of social media applications to public relations practice. In addition, comprehensive coverage of the role of social media in public relations is discussed throughout the text. As in so many other lines of work, mastering social media has become a key tool for public relations practitioners to engage in “direct conversations” with the public. No public relations textbook offers a more comprehensive discussion of social media. Every chapter begins with a contemporary issue relating to the chapter content – from ISIS terrorists’ use of public relations for diabolical ends, to Kim Kardashian’s tweeting controversy, to her step-father Caitlyn Jenner’s coming-out communications. 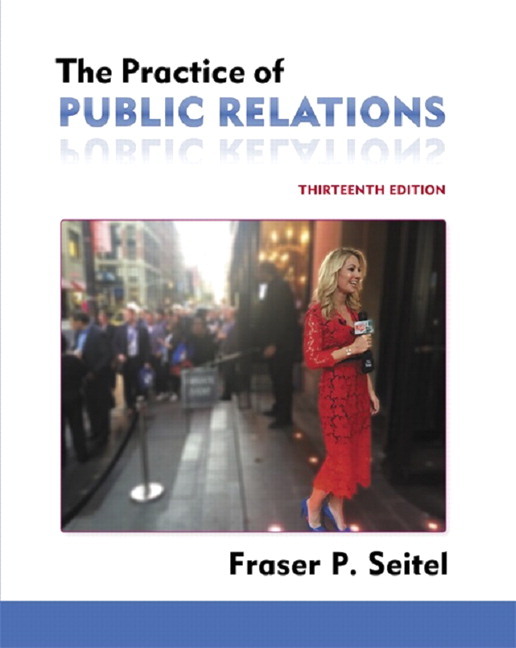 Fraser P. Seitel is a veteran of five decades in the practice of public relations, beginning, he claims, “as a child.” In 2000, PR Week magazine named Mr. Seitel one of the 100 Most Distinguished Public Relations Professionals of the 20th Century. In 1992, after serving for a decade as senior vice president and director of public affairs for The Chase Manhattan Bank, Mr. Seitel formed Emerald Partners, a management and communications consultancy, and also became senior counselor at the world’s largest public affairs firm, Burson-Marsteller. Mr. Seitel has been a regular guest on television and radio, appearing on a variety of programs on the Fox News Network and CNN, ABC’s Good Morning America, CNBC’s Power Lunch, as well as on MSNBC, Fox Business Network, the Fox Radio Network, and National Public Radio. Mr. Seitel has counseled hundreds of corporations, hospitals, nonprofits, associations, and individuals in the areas for which he had responsibility at Chase—media relations, speech writing, consumer relations, employee communications, financial communications, philanthropic activities, and strategic management consulting. Mr. Seitel is an Internet columnist at odwyerpr.com and a frequent lecturer and seminar leader on communications topics. Over the course of his career, Mr. Seitel has taught thousands of public relations professionals and students. After studying and examining many texts in public relations, he concluded that none of them “was exactly right.” Therefore, in 1980, he wrote the first edition of The Practice of Public Relations “to give students a feel for how exciting this field really is.” In four decades of use at hundreds of colleges and universities, Mr. Seitel’s book has introduced generations of students to the excitement, challenge, and uniqueness of the practice of public relations.